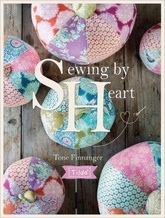 Sewing By Heart is a heartfelt sewing book from the creator of Tilda, Tone Finnanger. In this glorious celebration of her love of fabric, you'll find over 20 sewing, patchwork, applique and quilting projects that will bring color and beauty to your home. Projects include stunning quilts, pretty pillows, sophisticated soft toys and beautiful accessories such as pincushions, pumpkins, flowers, stockings and more-all designed with characteristic Tilda charm. Featuring gorgeous photography, in-depth instructions and full-size templates, you'll soon be sewing by heart. Unlike previous Tilda books, this title will be written in English, edited by Linda Clements, the bestselling author of The Quilter's Bible. Tone Finnanger is the founder and sole designer of the internationally recognized Tilda brand, which she started in 1999 at the age of 25. Tone grew up in Oslo, the capital of Norway, and now lives and works on a small island in the Oslo fjord. Her education is in classic painting and graphic design. Tilda has been a lifestyle for Tone, and has developed over the years to be a much-loved brand among crafters.